photo: Curtis Walker goes up for two of his game-high 24 points in the win over Olympic. photo by Rick May. 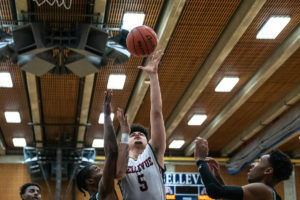 A 46-point first half was all Bellevue College men’s basketball needed tonight in as the Bulldogs defeated visiting Olympic College 84-67 tonight at Courter Family Athletic Pavilion. Curtis Walker dumped in 16 of his game-high 24 points in the first half to lead Bellevue’s early charge. Walker was 7-for-11 from the field including a perfect 2-for-2 from three-point range and also led BC with three rebounds and two steals in the first half. Walker’s hot hand led Bellevue to a 59% field goal percentage as Olympic could only manage shooting at a 35% clip before heading into the locker room. Although Olympic managed to cut some of the deficit, outscoring BC 45 to 38 in the second half, the 46-22 lead at halftime was too much for Olympic to overcome. Malik Sanchez added 16 points and had six rebounds while Ting-Jhao Jian had nine assists for the ‘dogs. Bellevue moves to 3-3 (12-7 overall) while Olympic drops to 0-6 (4-15 overall). The Bulldogs host Everett this Wednesday January 30 at 7:00 p.m. The matchup will be Bellevue’s opportunity to get within two games of first place as the Trojans come in undefeated at 6-0 in league.